This post serves a part two of a two part series that samir kaji and I are co-authoring to help VC’s navigate through fundraising cycles and engender better and more relevant relationships with LP’s. Samir’s first post dug into LP emerging venture fund manager preferences. With this second post we wanted to turn the tables and share advice for GPs (emerging and established) looking to assess if an LP is a good fit for them. 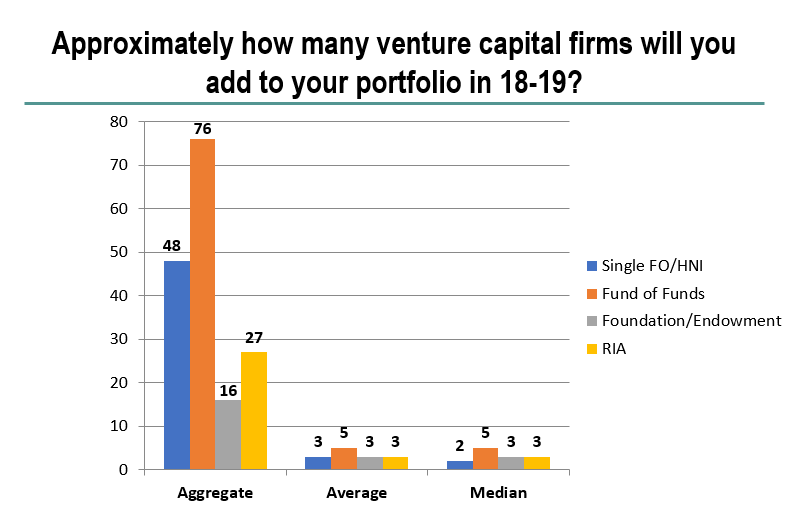 As the above graph* shows, even with LPs who are already looking to add new venture fund names to their portfolio, LPs add quite selectively. There are savvy ways to efficiently and effectively get to know an LP and in so doing, quickly determine if you’re a good fit for investors. And it starts with questions. Between Samir, who manages over 300 VC relationships at First Republic, and me as a limited partner (LP) in early-stage venture funds, we have spoken to hundreds of VC fund managers (general partners or GPs) in the last few years alone. In the “getting to know you” phase, I’d say that only half of GPs ask the most critically revealing questions about an LP’s business — even though the answers given may have meaningful implications for the GP. We understand why this is so. The LP world isn’t very transparent (though hopefully that’s changing with the work Samir does on his blog, Origins and 20minuteVC are doing interviewing LPs, OpenLP and other GPs and LPs writing blogs, speaking at conferences etc). For GPs new to venture, they’re navigating new business relationships with little to no training or playbook to guide them. Even experienced GPs often lack exposure to the fundraising side of the business — it’s not uncommon in established funds to have a single partner responsible for raising money. My hunch is that most GPs do want to ask questions, they just aren’t sure how to go about it or are simply reticent to do so in fear of offending a potential investor. Our advice: ask the right questions early, and often. As a GP, you have to understand LPs to make sure that they’re the right fit for you, or if you even have a shot at earning their investment. As an LP, being asked questions by a GP helps get to the bottom of things much more efficiently. This will also help GPs prioritize by spending time with LPs that are an actual alignment versus those that might be data collecting. 1. What are you currently investing in? The majority of times I meet with GPs, they’re eager to start pitching — which is often why we’re meeting in the first place and is an exciting part of my job. But I usually like to ask if I can talk to you about Sapphire Ventures first to give an overview of who we are what our investment thesis is. That way, we can find out early in the conversation if there is alignment between the fund you’re raising and what we’re investing in. If there isn’t alignment, you’ve just been spared making your well-thought-out pitch only to find out that your fund is out of scope for Sapphire. Additionally, often times a LP will offer critical clues about what they care about which will allow you to tailor your pitch to what that LP cares about. So when you walk into a meeting with an LP, pause to ask them about their business first, instead of jumping right into your pitch. In my opinion, this starting point makes for a more seamless and graceful conversation. Additionally when available, always do your due diligence researching the LP (organizationally and personally) prior to the meeting. 2. Why venture and how long have you been investing in it? I like this question because it’s an open-ended way of learning about an LP’s interest, experience, and perspective on venture. Understanding more about an LP’s background in venture helps you filter choices for a good fit for your fund. Maybe you want to weed out investors who don’t know how the venture capital asset class works. Investing in venture is different from writing an angel check or investing in more liquid assets. There isn’t anything inherently wrong with taking on LPs new to venture, but it does mean taking the time to teach them the ropes. Alternatively, you might be searching for an LP that will add value to your fund by sharing their expertise and opening their network by way of introductions. Learning about an LP’s track record gives you a window into their larger investment philosophy. Ask open-ended questions and LPs will often bring information to the table that you hadn’t even thought to ask. It can also be a method to gauge how committed an LP is to venture and whether they’ll be there long-term for future funds. As a GP, you’re looking for persistence in partners who will invest with you over multiple fund cycles. 3. How much capital do you have under management, and how much of that is invested in venture? As a GP, you want to size the breadbox and figure out how much money is actually available to invest in you. A university endowment might have a whopping $10 billion under management, but perhaps the majority of it is going into public markets or other forms of alternative assets (buyouts, hedge funds, etc.) with very little trickling into venture funds. Just because an LP has a lot of capital doesn’t mean they’ve allocated that capital specifically for venture. Some LPs earmark money each year for venture investments. Sapphire, for example, has $2.5 billion under management. A big chunk of this is for our Fund Investments business, where every dollar is dedicated to venture and we invest annually on a programmatic basis. It’s important to remember that LPs come in all shapes and sizes, and learning about an LP’s desired fund allocation helps you position yourself accordingly. With a programmatic investor, you might have an easier time than with a platform-agnostic vehicle, where venture has to earn its stripes on a per dollar basis. 4. How many venture managers are you currently allocating to? Will you be allocating to any new managers this year? Many GPs pose the simple question: “Do you invest in venture?” An LP could truthfully answer yes, but still not be in a position to fund that GP. One LP you’re talking to might only invest in name-brand funds like Sequoia, Benchmark and Accel year after year. They’re likely not looking to add new funds to their portfolio. Another LP might add new funds occasionally — say every two to three years based on how much available capital they have to invest in new managers. Another LP might even specifically build their platform to target net new funds to add on a more consistent, annual basis. Even if an LP doesn’t fall within your fundraising timeline, it never hurts to start the relationship early. LPs, particularly larger institutional ones often like to meet a fund two to three years before investing to build a relationship. They like to see how your fund operates over a full cycle — they want to hear your story, get a sense of who you are, and can watch it happen. 5. What strategies and geographies are you actively investing in? “Strategies” is LP-speak for the kinds of funds an LP is targeting. They might be early-stage or growth-stage funds. Or maybe the LP is focused on a specific sector like AI, or enterprise IT broadly. Strategies can also be geographic plays, targeting the Tri-State area or Europe. Sapphire’s Fund Investments business, for example, focuses on early-stage (meaning primarily Series A focused) funds in the United States, Europe, and Israel. 6. What is your preferred check size and fund size? That means that they need a $500 million dollar fund. You can take the meeting with them and listen to their advice as investors. They might even refer you to other investors — but your odds of successfully fundraising from them are low. 7. What has been your history of supporting fund managers in follow-on funds? When you have not followed on in a fund, why not? While it’s rare that an LP will provide any guarantees of investing in future funds, it is important for GP’s to understand whether the LP traditionally has supported managers across multiple fund raises (and through economic cycles). As a manager, an important element of durability is building stability with your LP base and knowing who may or may not be there for the next fund will greatly help with planning ahead. 8. Who is on the investment committee and what is your process for allocation approvals? LPs are a diverse bunch — maybe your target LP is a family office and the decision-maker is a family member with a background in tech. Or, the LP might be an endowment with an investment committee comprised of alumni, a large pension fund that hires outside consultants to help select managers, or a fund-of-funds with a dedicated team for venture and the ability to make direct and indirect investments. Understanding the mechanics of how an LP operates gives you more clarity into the investment process — and who is actually voting on the decision to invest in your fund. When you’re pitching your fund, the representative you talk to might be the person you’ll end up working with (presuming an investment is made) and a staunch advocate on your behalf. However, it’s also possible that the institution evaluates potential investments through a committee of people you will never meet — and your fund will be measured entirely based on a written investment summary they are given to read at the same time they are reading reports on multiple other investment opportunities. Make sure to know your audience and understand your access to the decision-makers. 9. Outside of great returns, what are your expectations of GPs post investment? Having a healthy relationship of any type requires great communication prior and during the relationship. Understanding what the LP expects in terms of communication cadence and style is critical in ensuring strong alignment. While it may not be practical to create a bespoke relationship plan for each individual LP, uncovering general themes will help create the right type of ongoing engagement (and increase the likelihood of future allocations). Conversely, if the LPs expectations of engagement post-investment are not in alignment with you, it’ll serve as sign to potentially pass. Even more so than GPs, LPs work in a people business. As Chris Douvos, an LP at VIA Funds points out, “GPs invest in business ideas that can be evaluated in the context of a more easily understood set of variables while [LPs] invest in people, a far more intricate asset.” That doesn’t mean that LPs have it harder, or vice versa. It simply means that LPs aren’t making direct bets on companies to succeed — they’re betting on the managers they choose. If you’re a GP pitching an LP, knowing what they invest in and if they’re even making investments is critical information. For GPs with existing LPs, knowing more about that LP base — what their focus is and why they do what they do is just as important. It’s my hope that we’re building a more vibrant tech ecosystem, with greater involvement and dialogue between LPs, GPs and startup founders. What will help us get there is sharing a little more of the same language — and asking more questions. The opinions expressed here represent those of the author and not necessarily the views of Sapphire Ventures. *Graph is taken from an LP survey conducted during the Raise Conference. Some 50+ LPs were surveyed.